I love to travel: it is always a delight for me to be away from home, I don’t know why.The feeling of being in transit kinda brings joy to my heart. I also realize that as a writer it brings inspiration, the kind that comes with a fresh perspective on life. It is always amazing to see and meet people who sometimes have absolutely no idea where you are from. The most they know is who they are and where they are from. I love getting to meet and know new people: being in places where I am not known. need to try. By able I mean: if you can afford the trip and also have a back that can sustain you sitting in a bus for over 8 hours. But the bus companies that do these trips have great buses. The buses are 4 sitters separated by an aisle. That means two at each side. They have arm rests and one is able to pull back and lie in them at an angle which is very comfortable. 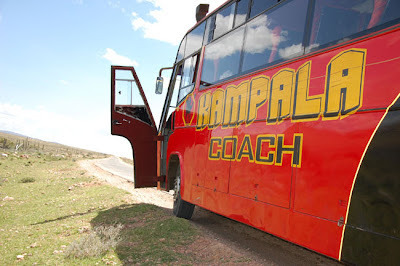 So if you planning on taking a bus/road trip to Kenya or Rwanda: here is what you need to look into. Not comprehensive but a guide. I realize that not everyone has been as lucky as I have: but more so, there are people looking forward to doing this. some water, juice and something light to munch on either banana crisps or digestive biscuits and an apple. You do not want to eat heavy because roads are not smooth. So half the time: the ride is bumpy. Now that is not good for a full tummy. If you are want to eat heavy: a good meal 2 hours before departure should sort you out! The buses usually make bathroom stops: but I am yet to see really clean toilets. If there are, they are for payment which is okay. Different Bus services have different petrol stations that they stop at for passengers to use the bathroom. Also note that there is usually a maximum of 30 minutes break and the buses have about 50 passengers, 98% of whom want to use the bathroom. average clothing depending on the weather would be okay. Some people usually carry a cushion and a head rest as well. I have a head rest but use it mainly for longer journeys by air. from me. If I lend it out then I have to wait for them to finish filling out the form and that is not convenient at times, or I risk losing it! that will help you find a cab to your destination. So please: carry some mints and gum to help with your breath. Bad breath is always a put off! For the ladies: a small make up kit just about when you are about to get off the bus is not a bad idea. The main make up may be in the main luggage: its okay to leave the bus looking good and fresh after moisturizing your lips and using some of that deodorant! Boosts your confidence as well. Entertainment: a fully charged phone that captures FM radio stations is great, but only if you are ready to keep scanning for radio stations: some of which may be boring. But this could be a great pass time. An iPod or mp3 if you have one is a great idea and so is an iPad though the latter is bulky. During the day: you can carry a book and or magazines: though I am sure that at one point you will dose off! And when you get to your destination: go have fun, discover and experience what it means to be in another country. And good enough, all Kigali and Nairobi come with different cultures and languages. Take time away from Work, Conference or whatever reason it is for which you have travelled and experience life in another land! Been an extremely long while since I last travelled by bus beyond borders! I have bookmarked this for my next trip which should be soon. Danke! Thank you @ssbab for always reading my writing. You do give me reason to keep doing what I do. Thank you. And enjoy your journey for when you take that bus. What's the fair for these bus services? @Bus Buttleworth: The fare you mean? It's about 2400/=Kenya shillings one way which is about 70,000/- Ugandan shillings.